The reburials took place over a five year period and were carried out by John Burch, a Salinian Tribal Council leader, tribal members said. The first set of remains was allegedly found in a cave in Arroyo Seco, north of Cambria. The second set was found near Toro Creek in Cayucos. Both locations are sites where Native Americans lived. But no one has determined that the remains were of Native Americans. Burch denied, in an interview with CalCoastNews, that he placed the remains on Morro Rock. “There are no remains up there. Your information is wrong,” Burch said. But tribal members, a Catholic priest and emails from the state of California say otherwise. Father Larry Gosselin, with Mission San Miguel, said he blessed the remains after Burch asked him to do so. Some members of the Salinan and Chumash tribes do not see Catholicism as being a Native American religion. Burch climbed Morro Rock carrying the human remains in a backpack, Salinian tribal members said. He placed the bones in two spots, cracks in Morro Rock and placed stones over them, tribal members said. Burch told tribal members that he had permission from State Parks and the San Luis Obispo County Sheriff’s department to repatriate the remains, they said. However, State Parks Superintendent Brooke Gutierrez said that her agency did not give Burch permission to repatriate remains on the rock. California law requires that county coroners inspect remains and the California Native American Heritage Commission be notified before reburial. That was not done and it is not clear whether the remains are Salinian, Chumash, or even Native American at all. State law makes it a felony to dig up or posses Native American remains without following required procedures. 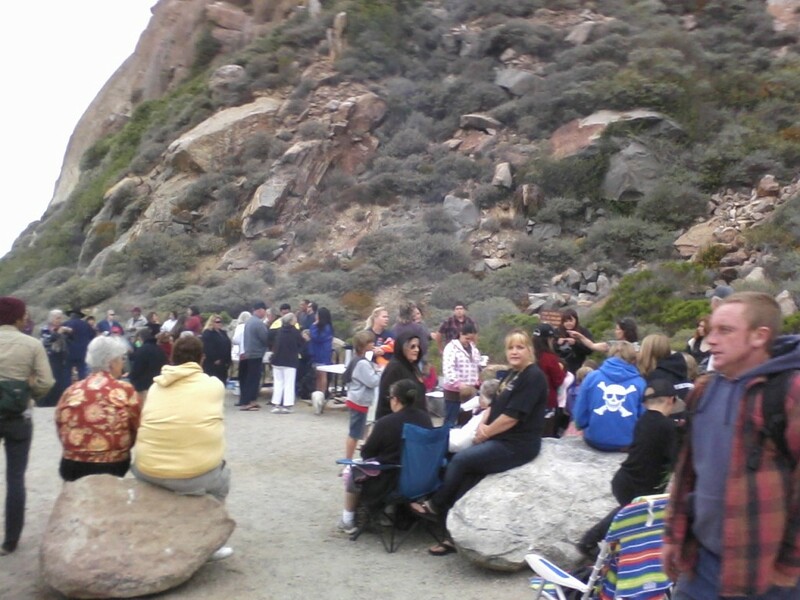 Six years ago, members of the Salinan Nation first received permission to climb Morro Rock through a memorandum of agreement between the tribe, state parks, and the Native American Heritage Commission. At the time, the Chumash argued that the site was sacred and solstice ceremonies should, instead, be held at the base of the rock. Collins said reburials are supposed to be private ceremonies, not the public events they have become with Burch inviting the media. Several members of the Salinan Nation, who asked to remain unnamed to avoid difficulties with tribal members, are also concerned with the failure to follow tradition at last week’s solstice ceremony where Aztec dancers performed for almost 200 nonnative attendees. In light of the recent solstice ceremony and allegations of unapproved reburials, Native American Heritage Commission Director Dave Singleton said his agency plans to revoke the agreement which allows tribal members to climb Morro Rock.